You load sixteen bits, and what do you get? This page describes some of the test equipment that was used in days gone by. It serves as a parking lot for photos of any TE that is obsolete by today's standards, but was the cat's pajamas way back when. Got some old photos? Send them in and we'll reward you with a gift if they make it onto this page! Here's a page on wavemeters which now includes a description of the HP536A thanks to Kerry. Also, check out our page on slotted line measurements, which includes a description of the HP805A, also thanks to Kerry. If there is interest we will create a page of historical hardware that is other than Test Equipment. We've got plenty of bandwidth, there is almost no limit to how much dusty old stuff that Microwaves101 can display. New for July 2013: we've added a link to a WWII-era movie that describes the manufacture of crystals for radio tuners. It is located on our crystal oscillator page. This is one of my favourite photos; it is in HP app note AN 77-3 Measurement Of Complex Impedance. My copy is dated 1 April 1967. The vector voltmeter is a HP 8405A (I have one in excellent condition!) The instrument on the left is a HP 3200A VHF Oscillator; the power supply on the right is a HP 721A. I can’t identify the coupler. The engineer is using a Smith Chart calculator; I know that Amphenol, FXR and Emoloid made these but many others also made them so this one is unidentified. The DUT is almost certainly an amplifier. 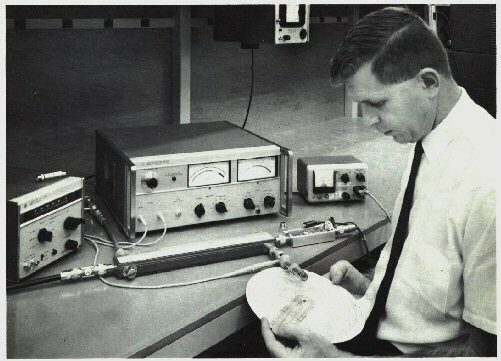 This test setup could be called the first vector network analyser; a long way from our present instruments. Below is a description of a WWII frequency meter from someone who once operated the same model. This is the unit we brought to the IEEE-MTT-S IMS 2013 up in Seattle. It weighs 25 lbs. but fits in aircraft overhead compartments. If you think it is difficult hauling 25 lbs. a mile without wheels, then consider that these were lugged across China, starting out up the Burma Road, where 200,000 Chinese had literally scratched out a path India. 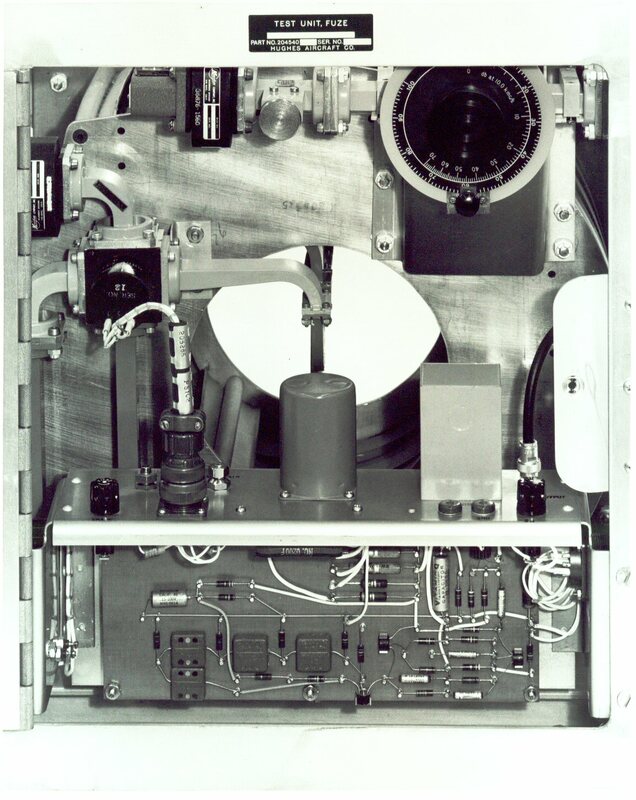 This device was used to generate any signal in the 2-30 MHZ range, primarily as a means to check on the frequency accuracy of quartz crystals used to set the operating frequencies of radio transmitters. The Frequency Meter contained a very accurate low-frequency quartz crystal ( l MHz? ) which oscillated in an internal circuit and then was amplified and fed to a distortion network (square wave?) which generated harmonics through the 2-30 MHz range......1, 3, 5, 7, etc. These harmonic signals were combined with the signal of a separate tunable oscillating circuit which consisted of a fixed inductor and a air-tunable capacitor. This capacitor had linear tuning characteristics which meant that the relationship between the rotational angle of the tuning shaft of the capacitor tracked linearly with the frequency generated by the oscillator circuit. In this way the signal of the Frequency Meter could be moved to the nearest harmonic of the fixed quartz oscillator and matched with the harmonic signal, using beat frequency detection, adjusting the frequency of the tunable circuit to reduce the whistle in a set of earphones to zero frequency. The harmonic signal was then turned off with the signal of the Frequency Meter ready to check the frequency of any external signal anywhere between the two nearest harmonic signal frequencies. The frequency meter was powered by 110 VAC, 60 Hz. In addition to checking on the accuracy of crystals being tested, this device was also used to set the frequencies of new crystals being ground for newly-assigned frequencies for transmitters. This required the use of a Crystal Grinding Set (another Signal Corps device) in which the operator would select quartz crystal blanks having a slightly lower oscillating frequency than the desired one, and then slowly and carefully hand-grinding the crystal blank on a grinding surface by sliding the blank with one finger, pushing it back and forth on the grinding surface (approximately 4"X 6") in order to thin the width (increase the oscillating frequency) of the blank crystal. This hand-grinding had to be done with extreme care in order to avoid passing the desired frequency by over grinding. The test crystal's frequency would be continually checked via an internal test oscillator jig in the Crystal Grinding Set; using the Frequency Meter to check its frequency, using beat frequency detection as described in the paragraph above. If ground too thin the test crystal's frequency would be found to be above the desired frequency, and the crystal would have to be discarded, starting anew with a fresh crystal blank. The Crystal Grinding Set was a cabinet approximately 2-1/2 feet high, 2 feet wide, and one foot deep. The unit was powered by 110 VAC, 60 Hz. The front panel swung down, revealing the crystal grinding surface, a test oscillator compartment for energizing the test crystal, and drawers for crystal blanks. Over-ground crystals were never thrown away but were kept in one of the drawers in hopes that they could be used later for some new frequency assignments. Their last frequency was inscribed in pencil on the crystal blank itself. Kerry contributed photos and descriptions of wavemeters and slotted lines. 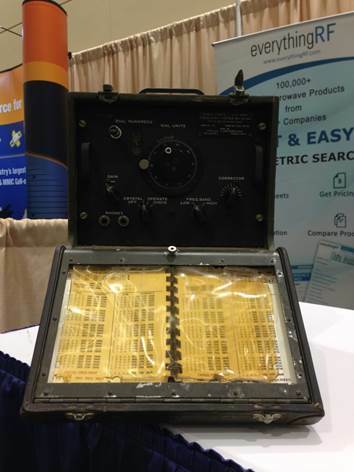 The HP536A wavemeter is described here. Thanks! Slotted line description is now here. 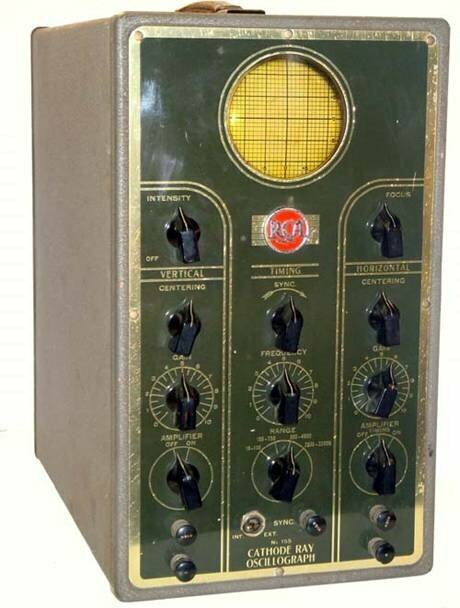 Here's a photo of an RCA Cathode Ray Oscillograph, contributed by David. This TE is now art in Dave's office, as an homage to his grandfather, a writer and inventor regularly featured in Popular Science decades ago. We believe it is from the early 1960s; write to us if you have any information on the exact vintage. Turns out we were wrong about this Dave's scope being from the 1960s: Kerry submitted two images of similar gear in order to clear up the origin (thanks!) It’s an RCA Model 155. 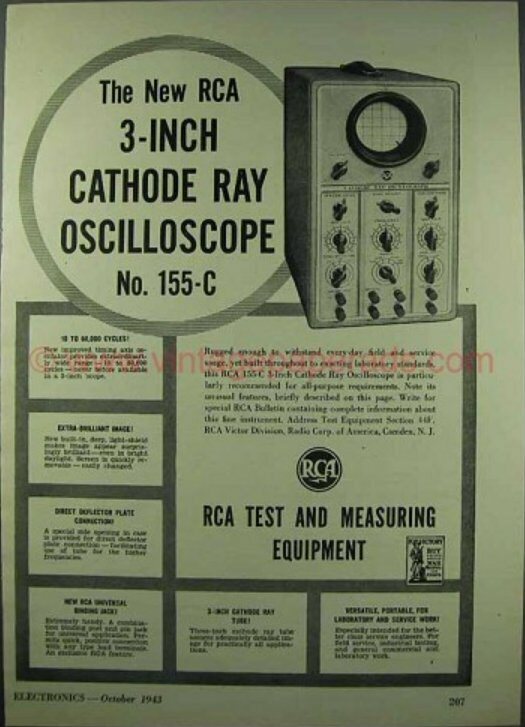 The panel changed a bit over the years; below is an image of an advertisement for the RCA 155-C oscilloscope. These were made from the late 30s to the mid-40s; high performance for the time, about 50 kHz bandwidth. Sold for $63.95 in 1938. Display was a 3-inch tube. Below is Les Besser sitting at one of the first versions of the HP automated network analyzer (ANA) which cost $250K way back in 1970 (about US $1M in today's less-powerful dollars). The modern network analyzer costs and weighs about 1/20th of this unit, and might indeed work over 20 times more bandwidth. Check out the dial telephone, and notice the four-legged chair of death Les is sitting on--try to buy one with less than five legs today! Here's a handsome Dude sitting at a Tektronix graphics terminal, several years before PCs were available. It dissipated enough power to heat the room, yet could take an hour or more to "draw" printed circuit board artwork of any complexity. In the background is a Radio Shack "Trash-80" for running very short Basic programs, and the Tektronix graphical output device which used thermal paper. You had to learn not to park your coffee cup on top of those printouts! Nice pocket protector, homey! 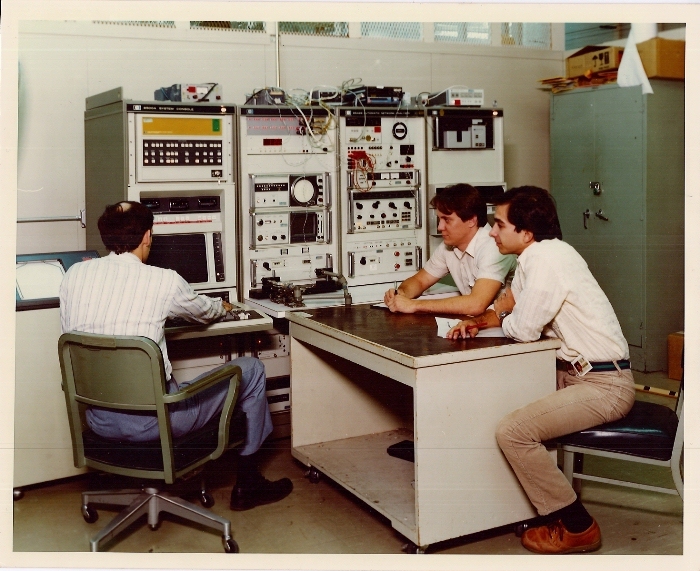 Here's a trio of geeks sitting around an HP 8409 automated network analyzer (ANA) circa 1981, complete with 16-bit HP computer (see the row of sixteen square buttons near the top of the left bay for programming in binary code?) You can't see it, but this unit featured a revolutionary trackball interface! On a good day it would give you data from 2 to 12 GHz, and even provided time domain outputs thanks to Harold Stinehelfer's software from "Made-it Associates". Check out the rotary joint test cable, which today would only be useful as a mugging tool. That Dude with his back to us was co-chair of the 2004 IEEE IMS Symposium, and has no idea that his picture appears on this web site, so don't tell him! And again, the four-legged chair of death appears. We sure lived dangerously back in the day! But wait, we were wrong about the model. This information was sent by Tom, who knows about this equipment first hand. Thank you sir! I was perusing your Historical Test Equipment page and noticed an error that I thought I could help with. The HP automatic network analyzer that you list as a model 8409, is actually the predecessor to an 8409, the 8542, which was introduced in 1970 as the first fully automatic vector network analyzer. It was a 3+ bay system that relied on multiple BWO signal sources to test over the full frequency spectrum, and was pretty hot stuff at the time, selling for about $250k, which would be over a million dollars in todayâ€™s currency. 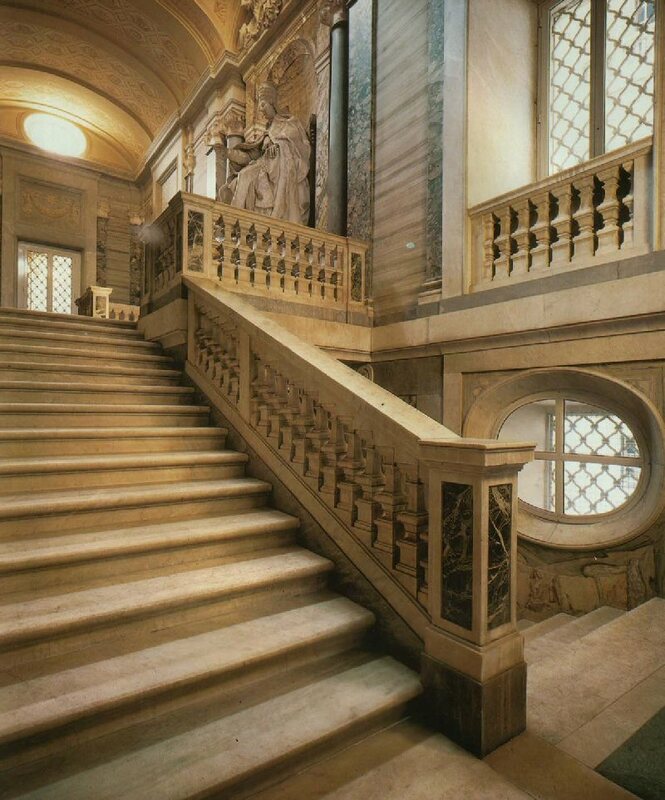 Ours was located in a special climate controlled room, and access was very tightly controlled. There was only one engineer allowed to use it, and you used to pass your hardware to him through a Dutch door and wait for a call that he was finished, and your data/hardware was ready to be collected. The processor was an HP 2100, with true ferrite bead core memory. The boot code was long list of code that had to be loaded manually, in octal, by pushbutton or switch from the front panel. As I recall, there were over 150 words of octal code to enter, and if you got even one digit wrong, it wouldnâ€™t boot. If it crashed, it could take you half a day to reload and get it running again, but, once it ran, it was a godsend to anyone who was trying to make accurate broadband measurements! "These four shots were part of a package sent to the contractor (US Navy) concerning the testing (for Rad Haz) of the parabolic antenna for a 10 kW X-band transmitter, to be installed aboard a Navy ship. This antenna was part of a satellite transmit/receive system; and was designed to remain locked to the satellite, independent of the pitching of the maneuvering ship. Results were rather interesting. A radiation level of one mW per square centimeter is considered safe. A level above 10 mw per sq. cm. is considered hazardous. It developed that until the beam was formed no hazard was present... you could peep into the antenna dish without harm. The beam finally formed about 200 feet in front of the antenna. From there out to about 1000 feet the hazard level was unsafe. Photo #1 (top left): the antenna, together with its automatic pointing base (see 2nd unit at the corner of the building) is pointed at the top of the ITT tower. A field receiver is set up at the base of the tree, 100 feet in front of the antenna. No hazard at this point. Photo #2 (top right): Test site at the base of the tree. Level of received signal is comparison-calibrated with a sig gen, using a waveguide coupler. Photo #3 (bottom left): Shot of the near-signal measurement set-up. That's me at the receiving site, under the tree. Photo #4 (bottom right): A shot of the antenna-to-tower path. The signal at the top of the tower was measured to be less than one mw per sq. cm., at a distance of about 1000 feet. The Navy concluded that this installation comprised no hazard to shipboard personnel since it would be mounted on the highest platform of the ship." Thanks, OAH! Click on each thumbnail for a high-res jpeg photo! The ITT tower was nicknamed "Sosthenes Behn's last erection" by some of the happy ITT employees that worked on the Nutley plant site. Sosthenes Behn was the founder of ITT, and was about 70 years old when the tower was built, in the pre-Viagra 1950s. ITT is (was) a conglomerate company with an interesting history, including ties to Nazi Germany. The tower was originally built for testing TACAN--the original direction finding equipment for aircraft. The tower could "see" for 100 miles in any direction. That would cover New York City plus Bergen, Hudson, Union, Essex and Morris Counties in New Jersey--i.e. a good piece of northern New Jersey. This tower was 300 feet tall!!! 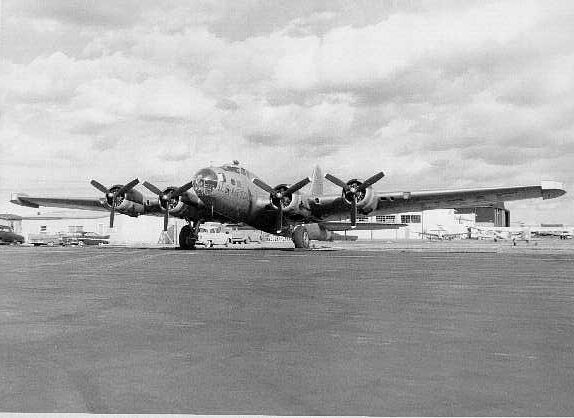 Here's ITT's B17 Flying Fortress (thanks for the correction, Doug!) outfitted with some special direction-finding equipment in the 1960's (see the large box out on the wing?) It was borrowed from the Army, but had the ITT logo on the tail. Engineers would fly this baby from Teterboro NJ to upstate NY on a good day, up to eight hours in the air. It was downright civilized, it even had a lavatory. But the power inverter was inches away from the "throne room", so you could barely hear yourself think, or whatever else you were trying to do! Click here to see a movie of the ITT tower being leveled by real estate terrorists (what fools these mortals be!) What happened to the ITT tower and surrounding lands? The ITT Clifton building was originally supposed to be part of a shopping center but ITT eventually bought it back and it is still a facility for ITT Industries, and it is truly an eyesore. The 500 Washington Ave building now houses a religious cult. The River Road building is a shipping terminal for some other outfit. The main golf course--the ITT campus where the tower was--is now covered with condos--town houses and a smattering of single family homes. 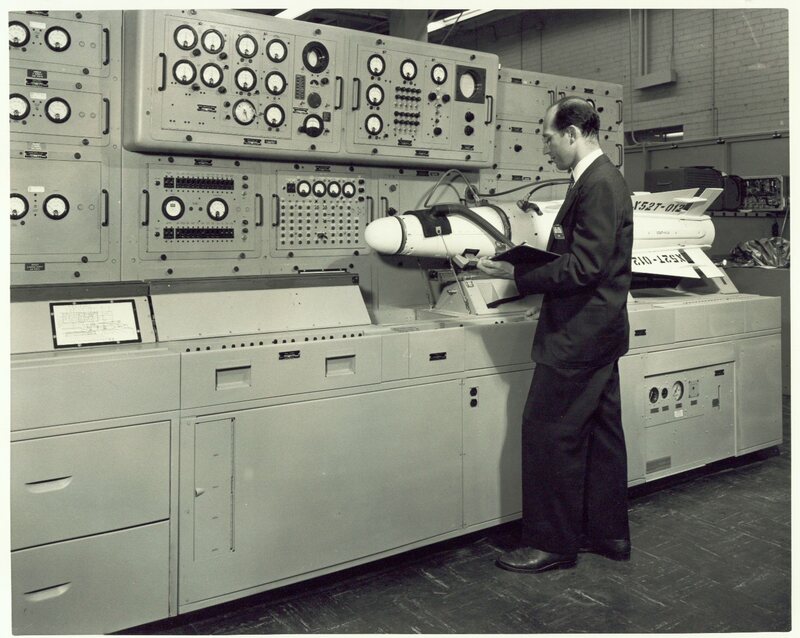 Here's two thumbnails of missile hardware from the old Hughes Aircraft corporation, circa 1960, contributed by Lorraine K. The well-dressed man at the test station is Mr. W. Keith Kilpatrick. Click on them to see enlarged photos. Nice shot of a Falcon missile... we've seen similar ones on Ebay! Want to see some slotted line equipment? We have some pictures on our VSWR page. Click here to go to our page on wavemeters.